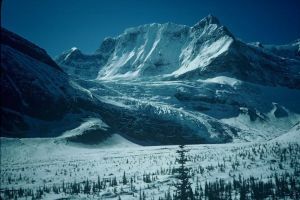 This peak is #92 on the Height List for British Columbia .Located on the continental divide, between the Lyells and Alexandra. It is 1 km NW of Farbus Mountain. This peak appears to have an enormous cliff on the east face and so would most likely be approached from the west, via roads up Lyell Creek. Name Notes: Named in 1918 after Oppy, a village where a battle was fought during World War I. The village is located south east of Lens, France.